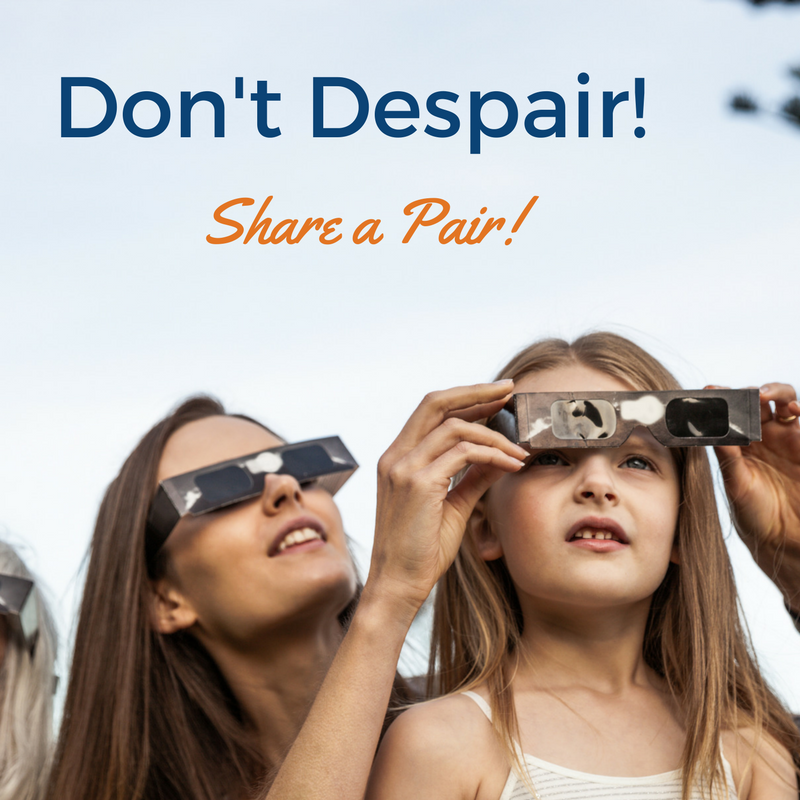 Don’t Despair, Share a Pair! August 17, 2017 (Columbia, S.C.) – The Total Eclipse Weekend Columbia, S.C. campaign understands that residents and visitors are concerned about procuring certified solar eclipse viewing glasses manufactured by NASA and AAS-endorsed companies. While many of the 120 eclipse events listed at http://www.totaleclipsecolumbiasc.com that are occurring in the Columbia, S.C. region from Aug. 18 to 21 will hand out free, certified eclipse glasses made by the NASA-endorsed San Diego company Rainbow Symphony to guests *at* many of the events, it is clear that some feel an urgency about getting glasses now. 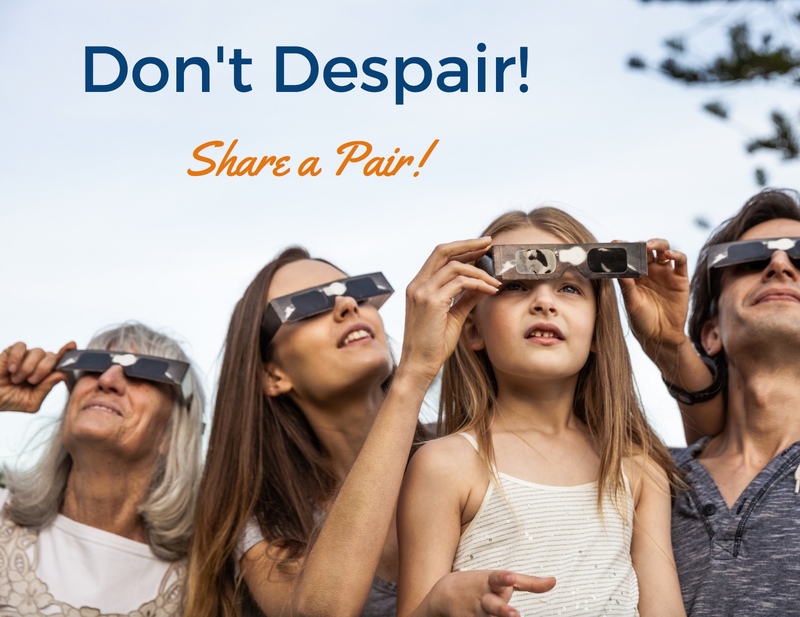 You can share eclipse glasses with your family and friends! Take turns tracking the progress of the partial eclipse as the moon moves toward and away from the sun, before and after totality. Note: You need certified eclipse safety glasses or solar viewing film only if you intend to look directly at the sun to view the partial solar eclipse before or after darkness falls at totality. You do not need eclipse glasses to go about your normal daily routine, however, and under no circumstances can you drive while wearing solar eclipse viewing glasses! In fact, eclipse glasses block out so much light that it is impossible to see anything *but* the sun while wearing eclipse glasses. Remember, most people do not look directly at the sun in their daily lives; an eclipse day is no different, unless you actively look up at the sun and gaze at it–which many of us do plan to do for short spells to watch the partial eclipse as the moon gradually moves in front of (and then away from) the sun. Irreversible eye damage and even blindness can result from gazing directly at the uneclipsed or partially eclipsed sun for even a few seconds without certified solar viewing eye protection. For viewers within the 70-mile path of totality, solar viewing glasses should be removed to look at the totally eclipsed sun once darkness falls during the 2.5 minutes of 100% total solar eclipse. At the S.C. State House at Gervais and Assembly, totality will begin at 2:41:51 p.m. and end at 2:44:20 p.m. Check your exact time of totality at http://www.eclipsecountdown.com. All 100,000 pairs of eclipse safety glasses ordered via the Total Eclipse Weekend Columbia, S.C., campaign were manufactured by San Diego company Rainbow Symphony, one of the most reputable NASA- and AAS-endorsed suppliers. Private businesses and major public event hosts like the Columbia Fireflies, Richland Library, Solar 17 at Lake Murray and the South Carolina State Museum ordered another 184,000 pairs of glasses from Rainbow Symphony through the campaign. Many of these also bear the “Total Eclipse Weekend Columbia, S.C.” design. Many of the events listed at http://www.totaleclipsecolumbiasc.com/event will hand out the aforementioned free glasses; check listings to confirm availability. Note: pets do not need glasses, as pets do not habitually stare at the sun. As noted above, eclipse days are no different in this regard. About Total Eclipse Weekend Columbia, S.C.
One of the Southeast’s most vibrant mid-sized cities, Columbia, S.C., is home to the longest total solar eclipse for a metro area on the East Coast and will host Total Eclipse Weekend Columbia, S.C., a long weekend of more than 120 eclipse-related festivals and events, from Aug. 18 to 21, 2017. At 2:41 p.m. on Monday, August 21, 2017, viewers in the greater Columbia, S.C., area will experience up to 2 minutes and 36 seconds of darkness in the middle of the afternoon. NASA estimates that South Carolina could see an influx of up to 1 million visitors to witness the U.S.’ first transcontinental total solar eclipse in 99 years. The Columbia, S.C., region’s long weekend of 120+ eclipse events includes a variety of large and small festivals; kid-friendly/family activities; food & drink parties; outdoor river and lake adventures; education, science & history events; art, film & music happenings and more. 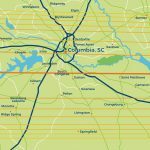 Dubbed the “Total Eclipse Capital of the East Coast,” Columbia, S.C., has been named a top U.S. viewing city, with coverage by the New York Times, USA Today, Buzzfeed, Newsweek, Fodor’s Travel, Forbes, the Chicago Tribune, the UK’s Telegraph, the Boston Globe, the Washington Post and others. Follow @TotalEclipseCAE and plan your Total Eclipse Weekend Columbia, S.C. at http://www.totaleclipsecolumbiasc.com. Total Eclipse Weekend Columbia, S.C. is a regional tourism campaign that was founded to create economic impact in the Midlands by inspiring local groups to host more than 120 eclipse events across the long weekend of Aug. 18-21, 2017, amplifying their efforts with a national public relations and marketing campaign, raising awareness of the Columbia, S.C. area as a vibrant, authentic destination filled with cool things to do all year round. Learn more at http://www.totaleclipsecolumbiasc.com. Majority of 120+ Total Eclipse Weekend Columbia, S.C., Events to Provide Guests with Free Eclipse Glasses, Courtesy of City of Columbia, S.C.